"Culture has always contributed to the subduing of revolutionary as well as of barbaric instincts. Industrial culture does something more. It inculcates the conditions on which implacable life is allowed to be lived at all." - provokes in me a desire to test its stability by letting it deconstruct. The paragraph relies so heavily on the thinking of opposites and differences. The meaning of “culture” depends on the meaning of “revolutionary”, and as Derrida would say the process is circular. The opposites relate to themselves rather than to what it purports to describe. And in this system of differences the first is invariable loaded with positive associations. But the real villain here is INDUSTRIAL culture. "Revolutionary as well as barbaric instincts have always contributed to the subduing of culture. Industrial revolutionary and barbaric instincts do something more. They inculcate the conditions on which implacable life is allowed to be lived at all." - now that’s turning Marxism against the Marxists themselves. Vi mener alle, at det gode ved et kunstværk og ved en kunstner er bevist, hvis han griber os, ryster os. Men da måtte jo dog først vor egen godhed til at bedømme og fornemme være bevist: hvilket ikke er tilfældet”. I’ll include the rest of the passage since it’s just so relevant – here, there, and everywhere! Who in the realm of the plastic arts has moved and enraptured more than Bernini, who has produced a mightier effect than that post-Demosthenes rhetor [Hegesias of Magnesia] who introduced the Asiatic style and caused it to predominate for two centuries? Such a predomination over entire centuries proves nothing in regard to the quality or lasting validity of a style; that is why one should never be too firm in one's faith in any artist: for such a faith is not only faith in the veracity of our sensibility but also in the infallibility of our judgment, while our judgment or sensibility, or both of them, can themselves be too coarse or too refined, exaggerated or gross. The blessings and raptures conferred by a philosophy or a religion likewise prove nothing in regard to their truth: just as little as the happiness the madman enjoys from his idée fixe proves anything in regard to its rationality. 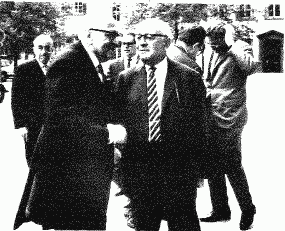 Picture: Max Horkheimer (front left), Theodor Adorno (front right), and Jürgen Habermas (background right) in 1965 at Heidelberg. I love your commentary on the Adorno and Horkheimer quotation. I think you are dead-on.